Professor Nabar, or DJ Nabs as we like to call him, will be at the IMF working on Asia, and his wife will be at the World Bank. What a badass couple they are. I'm totally going to visit. I'll be living with Toby in D.C.! [Stuy kids, visit us please] We will be learning how to cook/survive. We will also be studying for GREs. We, or at least I, will be going to Teaism all the time b/c I LOVE IT. Probably won't be blogging again for a while since I'll be heading to NY tomorrow, coming back for senior week/graduation, and transitioning into the real world. When the Vulcan children are studying, there are computers asking questions, and there's one part where you hear: "...non-rival and non-excludable." Vulcans study Econ too! If I were a vulcan, I'd be the best economist ever. So, actually, my last day of classes was yesterday, but today is the official last day of classes for the class of 2009. Seniors decorated the econ department last night. Professor Johnson's door has a sign that says "Don't forget to have babies." HAHA. Loves it. I don't really know how I feel about being done with college. I guess I don't feel quite done. Still have to write Johnson's paper and take 4 finals. Stuff I'm doing now for my LAST paper in college: Analyze the effect of monetary policy on the dollar [vis a vis the British Pound and Euro] from 2002-2009. Focusing on decoupling of mortgage rates and targeted federal funds rate, fall of Lehman and announcement of TARP. Time for a study break at Professor Joyce's house! I'm going to be singing this song all the time when I get out. Pags, stop trying to solve this and go finish your work. 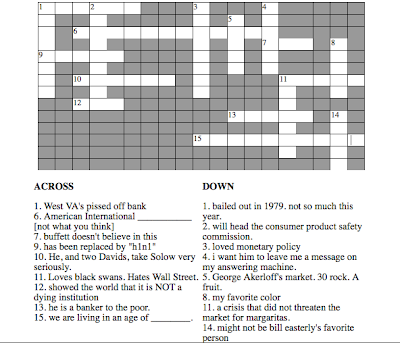 I'm going to post future crossword puzzles on Friday afternoons so people can do them over the weekend. I don't want to be blamed for procrastination! Christina Romer's testimony before the JEC.